COOKING UP A STORM : COOKING UP A STORM: GREEK COOKING SAUCE, PLUM ZEN JAM, VERJUS, RENAISSANCE MIX, PEAR CHUTNEY, GREEN TOMATO MINCEMEAT,PINOT JALAPENO MINT JAM AND THE MIXINGS FOR CHERRY RHUBARB CRISP. EASY RECIPES FOR USING OF EACH OF THESE ITEMS WILL BE INCLUDED IN THE BASKET. HAPPY COOKING. EACH BASKET HAS A SPROUT CHARM FROM LIFE OF RILEY. Shop our online store for baskets and add on items. Use this link to shop! We look forward to cooking for you again soon! You can also create your own CUSTOM BASKET by choosing from any of the items in our online store. Pam's Jammin' jellies, jams & sauces. Dried tomatoes & fruits. 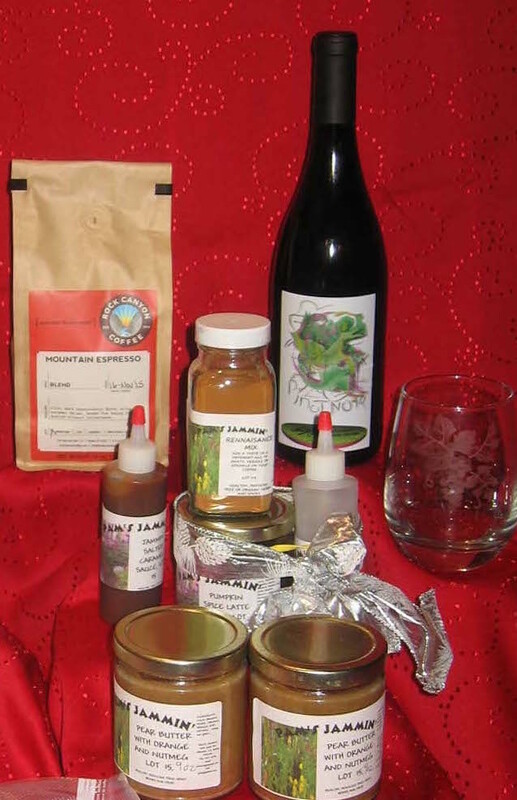 Specialty items like Verjus, Rosemary Infused Olive Oil, Olive Tapenade, Truffles, Rocky Canyon Whole Bean Coffee. 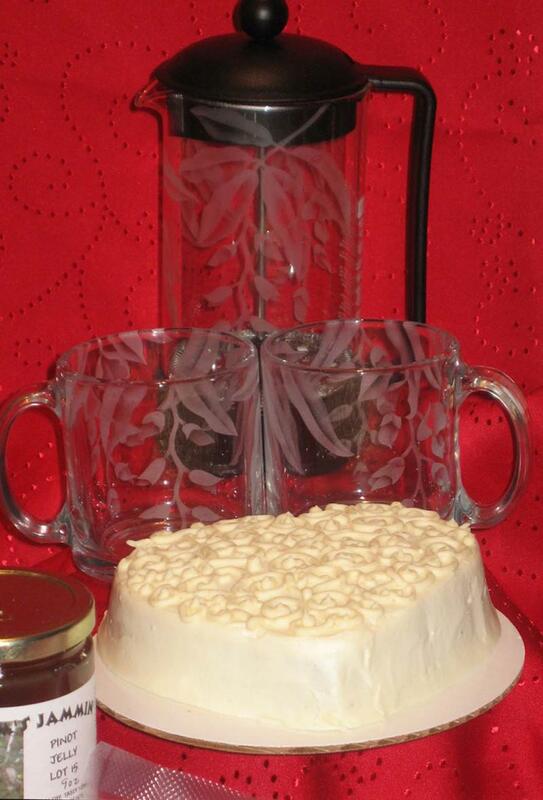 YOU CAN ALSO ADD ETCHED GLASS CUPS FROM ABEL ARTS OR JEWELRY FROM TESS BACKHUS. ADD A LIVING VASE FROM VALLEY VEGGIES OR KALE CHIPS FROM HOMEGROWN. WINE CAN BE ADDED TO PICK UP ORDERS ONLY. SHIPPED BASKETS WILL HAVE SHIPPING CHARGES ADDED. Email us how much you want to spend, what kind of goods you'd like in it, whether you want it shipped and to whom. We will design the basket, take a picture for your approval and send it off. Pam's Jammin' is Pam Petersen and her selection of homemade jams, jellies & other kitchen treats produced locally in her new commercial kitchen. Spring, summer & fall you may find us serving up a tasty brunch on the kitchen patio, feeding wine drinkers at the annual West Elk Wine Trail dinner, or sipping lattes on the patio & enjoying the view of the vineyard. To be invited to special events be sure to use the contact us page and sign up for our email list.